On the other hand, ClassNotFoundException is nothing to do with compile time, ClassNotFoundException comes when you try to load a class in runtime using Reflection, e.g. loading SQL drivers and corresponding Classloader is not able to find this class. Apart from this fundamental difference between NoClassDefFoundError and ClassNoFoundException in Java, let's see some more points for better understanding. In short, both ClassNotFoundException and NoClassDefFoundError are caused by missing classes in CLASSPATH, usually due to missing JAR files, but if JVM initiates the process due to transitive reference and failed to load the class at runtime it throws java.lang.NoClassDefFoundError, while if your code explicitly tries to load the classes e.g. by using Class.forName() method and class is not present in CLASSPATH, then JVM throws java.lang.ClassNotFoundException. You will often find a NoClassDefFoundError actually caused by ClassNotFoundException, you can see it by looking for "Caused By: " word in the error message. 1) NoClassDefFoundError is an Error which is unchecked in nature, i.e. doesn't require try-catch or finally block. On the other hand, ClassNotFoundException is a checked Exception and requires mandatory handling using either try with catch block or try with the finally block, failure to do so will result in compile time error. 2) If you are experiencing NoClassDefFoundError in the J2EE environment, there could be the host of reason, one being multiple class loader and visibility of class among them. See 3 ways to solve NoClassDefFoundError for more details. 3) Often java.lang.ClassNotFoundException is thrown as result of following method call, Class.forName(), ClassLoader.findSystemClass() and ClassLoader.loadClass(). 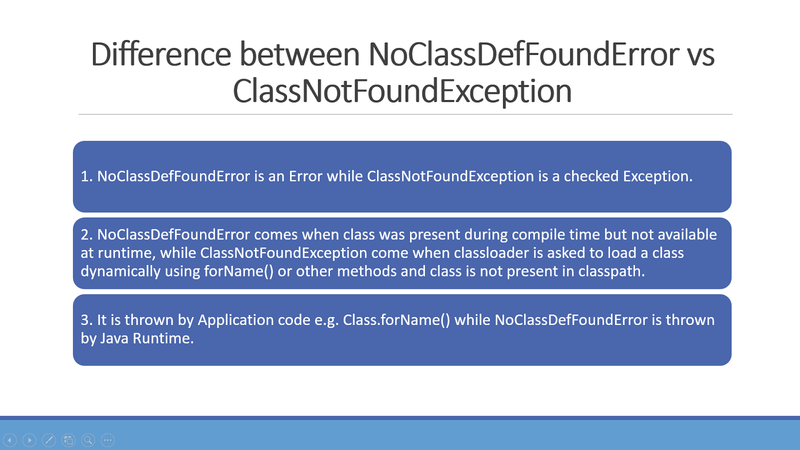 4) Another difference between NoClassDefFoundError and ClassNotFoundException is that NoClassDefFoundError is a LinkageError and can come during linking, while java.lang.ClassNotFoundException is an Exception and occurs during runtime. That's all on the difference between NoClassDefFoundError vs ClassNotFoundException in Java. Just remember these list of difference while debugging or troubleshooting NoClassDefFoundError or ClassNotFoundException, this will reduce confusion and help to solve the problem quickly.